Siberian Husky Characteristics: The sweet-tempered and loving Siberian Husky is a breed of medium sized dog, classified as a member of the Working Dog Group (AKC:1930). The Siberian Husky, is characterized by its small, muscular but graceful appearance with a clearly defined, fox-like head and dignified expression. Other characteristics include medium sized, almond-shaped eyes; medium-sized, close set, triangular-shaped ears; a fox brush tail and a quick, effortless gait. The temperament of the Siberian Husky can be described as Friendly, Outgoing, Alert. The coat type of the Siberian Husky is described as medium, thick double coat in assorted colors. Due to its characteristics and qualities, the Siberian Husky demonstrated the desired traits of a Sled Pulling Dog and is known by its nick name the "Team Racer". The origin of the Siberian Husky dog breed was in Russia where it was developed in the Ancient Times. Siberian Husky Breed Group and Dog Type - Working Dog Group (AKC:1930): The Siberian Husky is one of the many breeds of dogs that belong to the Working Dog Group (AKC:1930). Other names for the Siberian Husky: The Siberian Husky is known by the nickname of the "Team Racer". Other names for this breed of dog include the Chuchi, Siberian Dog, the Arctic Husky, the Siberian Chukchi, Chukchi Sled Dog. Origin of the name: The origin of the name "Siberian Husky" derives from its country of origin in Siberia, Russia. The name 'Husky' derives from the Inuit word "Ehuskemay" meaning an Eskimo. Siberian Husky History and Origin: The country of origin of the Siberian Husky breed was in Siberia, Russia over 3000 years ago. The Siberian Husky descends from the ancient Spitz type dogs and were used as a sled dog and hunting dogs by the Chukchi people of northeastern Siberia. Teams as large as twenty or more Siberian Huskies could travel out over the icy terrain and could cover up to 100 miles in a day, enabling a single Chukchi hunter to fish and return with his catch by the end of the day. The fame of the Chukchi Siberian Huskies spread and were famously used for sled-hauling by the polar explorers of the 1800's and early 1900's. Siberian Husky History - The All-Alaska Sweepstakes: In 1908 Chukchi Huskies from Siberia were introduced to Alaska for dogsled racing, notably the 408 mile (657km) 'Great Sled Dog Race' called the All-Alaska Sweepstakes. The Chukchi Huskies from Siberia were highly successful and American dog breeders gave them the name of the Siberian Husky. 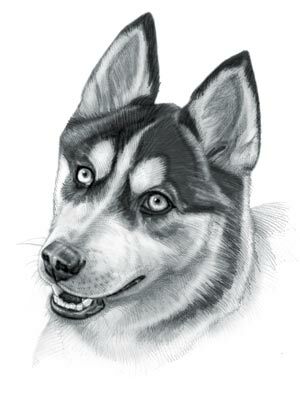 Siberian Husky History - Balto: In 1925 a deadly diphtheria epidemic struck the remote town of Nome, Alaska. Relay teams of Siberian Husky sled dogs were used to help carry diphtheria vaccine from Anchorage to Nome to bring the life-saving medicine (located hundreds of miles away) to the inhabitants. A dog called Balto led the team covering the final leg of the journey, driving through a fierce blizzard and a freezing river to safely deliver the diphtheria vaccine. American Sculptor Frederick George Richard Roth was commissioned to create a lasting tribute to Balto and on December 15, 1925 a statue of Balto was erected in Central Park, New York City. Siberian Husky Modern History: The Siberian Husky breed again proved its heroism when it was used by the US Army during WW2 as Arctic Search and Rescue dogs. The Siberian Husky was officially recognized by the American Kennel Club (AKC) in 1930. The modern history of the Siberian Husky moved on and the heroic exploits of Balto were captured in the 1995 American adventure film called "Balto". The Siberian Husky breed remains popular in sports such as dogsled racing and is enjoyed as a family pet and companion. Siberian Husky - Eight Below (2006 movie): In the 2006 movie 'Eight Below', starring Paul Walker and Bruce Greenwood, there are and six Siberian Huskies (Max, Maya, Truman, Dewey, Shorty, and Old Jack) and two Alaskan Malamutes (Buck and Shadow). The dramatic movie was based in the freezing conditions of Antarctica and the dogs pulled sleds and performed various stunts. Siberian Husky Height: The Siberian Husky breed is classified as a medium sized dog. The height to the shoulder of a male dog is 21-24 inches (53-61 cm). The height to the shoulder of a female dog is 20-22 inches (51-56 cm). Siberian Husky Weight: The weight of the male in this medium sized dog is 45-60 pounds (20-27 kg). The weight of the smaller female Siberian Husky dog is 35-50 pounds (16-23 kg). Siberian Husky Coat Type: The coat type of the Siberian Husky is described as medium, thick, dense double coat. Siberian Husky Coat Colors: The colors of this dog breed consist of assorted colors consisting of Black, White, Copper, Brown, Red, Grey, Sable, Black & Tan, Black & White, Silver, Splash, Agouti and Piebald. N.B. The term "Red" refers to reddish shades of orange, brown, and tan colors. Sable is a dark brown color. Splashed white or splash is a coat color of spotting patterns that produces pink-skinned, white markings. Agouti refers to banded hairs. Piebald are irregular patches of two colors. Siberian Husky Grooming - MODERATE Grooming Needs: The dog grooming needs of the Siberian Husky is not extensive and therefore categorized as Moderate in order to maintain a healthy coat, reducing the risk of skin infections. The modest grooming needs of the Siberian Husky is considered to be mid-maintenance requiring weekly brushing and combing. Dog Grooming Requirements should include bathing the dog on a monthly basis and making regular inspections of the teeth, eyes, nails and ears. Siberian Husky Litter Size: The litter size of the Siberian Husky dog breed ranges from 6-8 puppies. Siberian Husky puppies for sale can be obtained reputable breeders and from rescue centers. The cost of Siberian Husky puppies varies depending on location, pedigree history and the dog breeder. Siberian Husky Temperament and personality: The temperament and personality of this popular dog breed is described as Sweet-tempered, Friendly, Outgoing, Alert and Loving. Siberian Husky Exercise Requirements: The exercise requirements of this breed of dog are moderate. The Siberian Husky requires regular daily exercise consisting of about one hour every day. This medium sized dog has a quick, effortless gait with strides of a moderate length requiring a steady walking or jogging speed by the owner to meet the dogs exercise requirements. If the dog has more energy than you do, then teach your dog to play ball in a chase and catch game. Siberian Husky Diet: A fully grown Siberian Husky dog should be fed 2 times per day. A diet consisting of a premium dog food can be balanced with fresh food eaten by the family. The question is What Can Dogs Eat?. Check out our comprehensive list of what dogs can and what dogs cannot eat. Siberian Husky Health Problems: Potential health problems of the Siberian Husky breed include Hip Dysplasia, Eye problems . Resolving health problems can prove to be expensive and it is always wise to obtain pet insurance or dog health insurance when buying a dog. Is the Siberian Husky dog breed said to be Hypoallergenic? Answer: No. Siberian Husky Lifespan: The life expectancy of dogs vary according to the size, breed of dog and any serious health problems. The typical lifespan of the Siberian Husky breed is 12-14 years. Siberian Husky Male Dog Names: Male Dog names are most often chosen to reflect favorite names of the owner or the strength, size, coloring and country of origin of the Siberian Husky breed. To give you some inspiration regarding good male Siberian Husky names our small selection might be of help with naming boy dogs. Our top male dog names are: Vitaly *** Misha *** Ruslan *** Ivan *** Taras *** Danya *** Eugeny *** Rostik *** Maxim *** Tikhonov. Siberian Husky Female Dog Names: Female Dog names tend to be softer, prettier and reflect the temperament of the girl dog. Our top choice of good female Siberian Husky names are Nastya *** Dasha *** Marina *** Vika *** Olga *** Sasha *** Yana *** Masha *** Taya *** Olena.